The magnificent Grand dictionnaire Ricci de la langue chinoise, better known as le Grand Ricci, has just been released on DVD, almost a decade after its release in book form and exactly four hundred years after the death of Matteo Ricci. The list price is 120 euros (about US$150), which is much cheaper than the printed edition. A long video in French (16:31) discusses the work. For those who would prefer something in English, a PDF gives background information on the dictionary project. 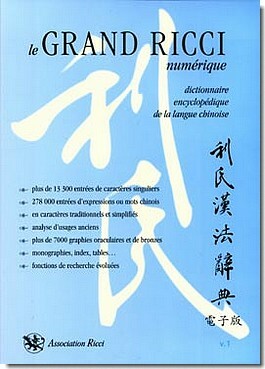 For a sample of the dictionary’s format and entries, see the 25 pages of entries for shan. Alas, as this example shows, the entries are not word parsed. But at least Hanyu Pinyin is now available for those who prefer it to Wade-Giles. As long as I’m mentioning Ricci-related work, I might as well use the occasion to note that the Taipei Ricci Institute is putting its collection of books on permanent loan to Taiwan’s National Central Library. 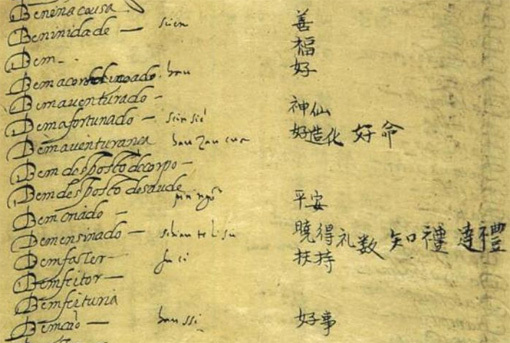 Also, I’d like to note that parts of Matteo Ricci’s original dictionary can now be viewed through the Google Books scan of a publication from earlier this century of his Dicionário Português-Chinês.